Through Vidyarthiplus Shop Earnings (VSE) Account CP, the seller can track the Study Materials Price Details ,Commission Details and Its Status. On the Order Tab , you can view the New Orders and Commission placed for your Study Materials. The Commission will be automatically credited to your SLE Account within 1 week. Payout will be processed using Vidyarthiplus Share , Learn and Earn (SLE) System. You can request payout on 1st to 8th of Every Month. Payout will be Processed on 10th of Every Month. To Request payout, your commission earning must be Rs.50 or Above. We Collect the Study Materials from all over INDIA. Contact Us and Our Team will guide you the Process of Sending the Hard Copy Study Materials to us. If there are more than 10 Study Materials the courier or parcel charges will be paid by us. 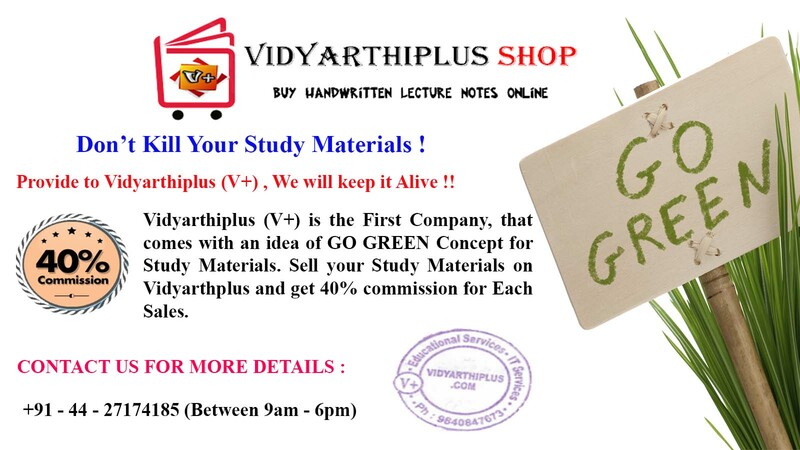 * Commission Period is 5 Years from the date of study materials added to Vidyarthiplus Shop. After 5 Years, the Seller will not receive the Commission and status of Study Materials will appear as "Expired" in the VSE Account CP. * The Price of the Study Materials will be reduced when an New Version Same Subject Study Materials are added to Vidyarthiplus Shop. * Not all Study Materials we receive will be accepted. The Study Materials will be Accepted based on its Quality. * If the Study Materials doesn't contain enough Content or the quality is Poor , it will be shared Freely on our Vidyarthiplus Education Portal. Paddpai - Tamil Nadu 601301. Lectures and Students with proper College ID are allowed to Sell Lecture Notes and Study Materials on Vidyarthiplus.com.